Its been a while since I blogged about Conduit, and a lot has been going on. My main task has been working on the conflict resolution UI and on tweaking the conversions between datatypes so as to maintain maximum fidelity. John Carr, the other main Conduit contributor has also been working on some awesome stuff. In any situation when (for backend specific reasons) a comparison between data is unable to determine which is newer than the other. Dataprovider backends communicate conflicts to the UI via signals. The UI has access to the conflicting data so can offer the user the ability to compare which is newer. 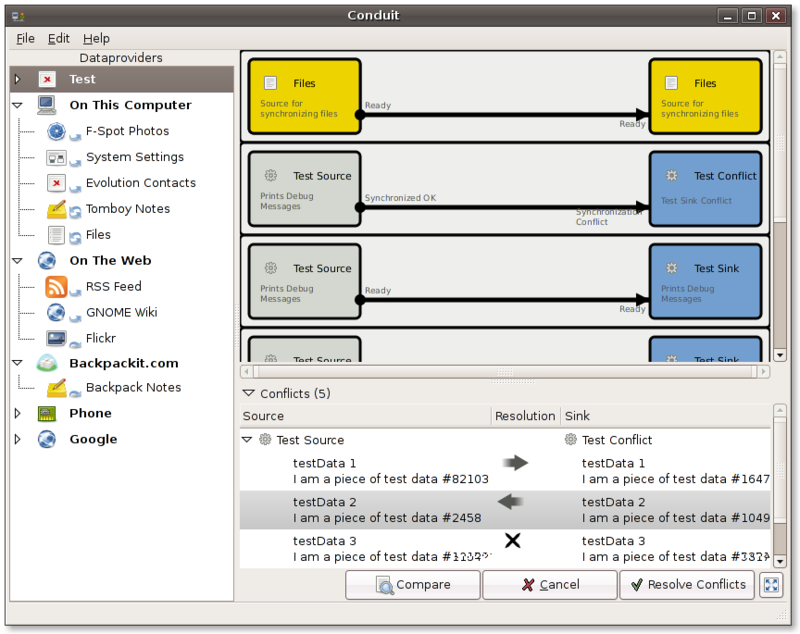 Conflicts use the same arrow metaphor that the main UI uses and can either be resolved in the main window, or be shown with more detail in their own window. If the data has set a (gnome-open'able) URI then the user can view the data at this location and decide which is newer. For example, a user is synchronizing his Tomboy notes via an iPod. If there is a conflict in this scenario then clicking Compare will cause Tomboy to show the local note and will launch a text editor to inspect the conflicting note off the iPod. (Lazyweb request: Any idea on how I might arrange the windows side-by-side via libwnck for example). The main difficulty with synchronizing different datatypes, or the same datatypes but via a middleman is maintaining fidelity (that is not losing any information) during the whole process. In the case of contact or calendar data then the default would be to support just standard datatypes (vcard, ical, etc). Opensync 0.30 is looking to define their own XML schema for basic datatypes, and I would support this idea and likely adopt the same schema. Apple .mac uses strict datatypes and pushes everything to a central server. One alternative to maintaining fidelity is to keep data in all formats but maintain a single canonical source of modification times, and perform conversions (even if they lose fidelity) only when needed from this central store. This leads onto my next suggestion Having an optional central repository (like .mac) not only addresses some of the difficulties of maintaining fidelity through conversion but also opens up some other use-cases which the open source world has not addressed. One click file sync with no configuration. So lazywab hackers. Who here is a Django hacker that wants to write me a web service to do this. I already have a documented API that you could write against. I have the spec, the idea, but not the time. I had considered writing this myself, and setting it up as a paid service (I would pay a few dollars a month to be able to do this) but dont have the time, nor the web development experience, nor an inclination of artistic ability to make it look nice! Any takers, please email me! John has finished up all the remaining pieces to allow iPods to be hotplugged/removed in conduit, so that synchronization settings and state are preserved. He is also hacking on direct computer-computer sync over local network. Using avahi for discovery and pickling data over the wire. Should be awesome when this lands! Unfortunately I was not eligible for summer of code this year, I am on holiday from university for six months and wont be starting PhD till after the summer. I was pleased to see mention of Conduit in the Ubuntu SOC ideas page, so I am glad to see distros recognizing the importance of making synchronization easy! Update: Google just released python GData bindings. This will make excellent support for Google Calendar, Google Notebook and a few other ideas I have up my sleeve a reality in the near future!. My blog is also back up, sorry for the trouble.